John R. Dethmers was born in Plessis, Iowa, on October 5, 1903, and grew up in Orange City. He enrolled at Hope College in Holland, Michigan, then went on to the University of Michigan Law School and began to practice law in 1927. Dethmers was a member of various judicial associations and was a family man with three children. 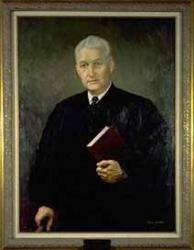 Dethmers served on the Michigan Supreme Court for 25 years, including nine years as Chief Justice. He was 42 years old when Governor Harry Kelly appointed him to the Court in 1946. By then he had already accumulated 13 years of experience in government as City Attorney for Zeeland, Prosecutor for Ottawa County for four terms, Legal Advisor to the Governor, Chief Assistant Attorney General, and as Michigan’s elected Attorney General. He mixed freely in Republican Party politics during this time, rising to his party’s state chairmanship as an “anti-boss” candidate. Dethmers, rugged individualist that he was, scorned staff help when he could do without it. He was proud that in his last 17 years on the Bench he worked without the assistance of even one law clerk, and with the thrift characteristic of his Dutch ancestry, he declined the privilege of driving a state-assigned car.